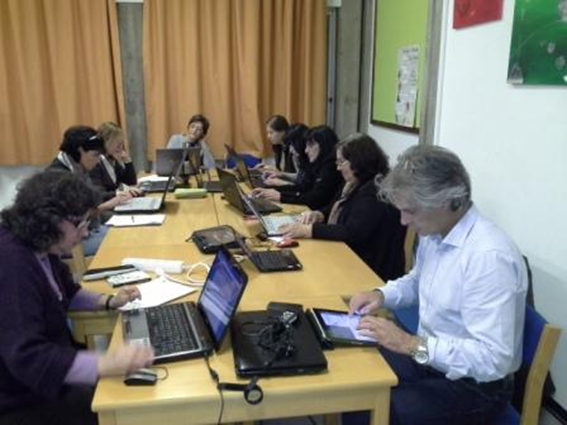 The Templarios Group of Schools, being involved in a both Comenius / eTwinning project(s), contacted the portuguese eTwining NSS in order to organize an inservice trainning course according to the portuguese rules for teachers inservice trainning. This was possible and it must be undrlined that the trainning responsables were members of the Innovation Department of the Portuguese Ministry of Education. This was an online course where trainnes might either work at home or in group, at school. Almost every thursday nights, from late September to mid December 2013 were inservice trainning nights. We think that this was a new approach "inside" the Comenius / eTwinning projects since the school decided to promote a trainning course to enhance the teachers themselves to the work of the main project we are involved in. Our gratitude to the Portuguese eTwinning NSS, in general, and, in particular to Mrs Rita Zurrapa, Mrs. Teresa Lacerda and Mrs. Miguela Fernandes.